Aerial photo of Mebee Pass lookout, taken February 2, 2013. 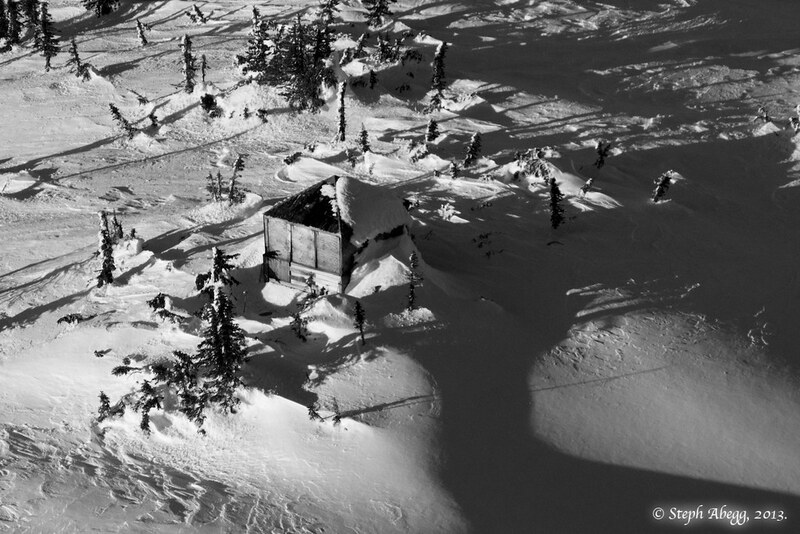 On February 2, 2013, John Scurlock and I teamed up another aerial photography flight over the wintery North Cascades. On a whim, we decided to make fire lookouts the theme of the flight, and we proceeded to fly past and photograph seven snow-clad fire lookouts in the northeast reaches of the North Cascades. 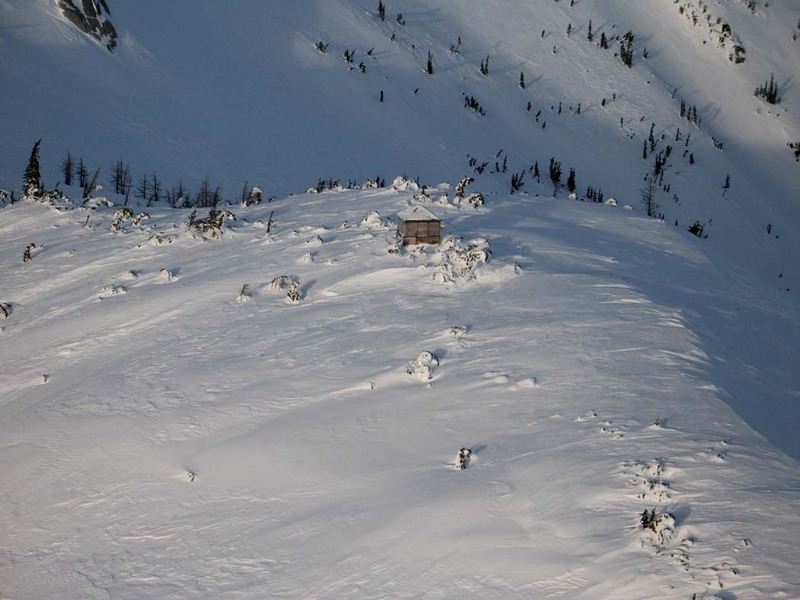 One of the lookouts we swooped past was the tiny 10'x10' L-5 cab located about 500' above Mebee Pass in the Okanogan National Forest about 18 miles west of Mazama. 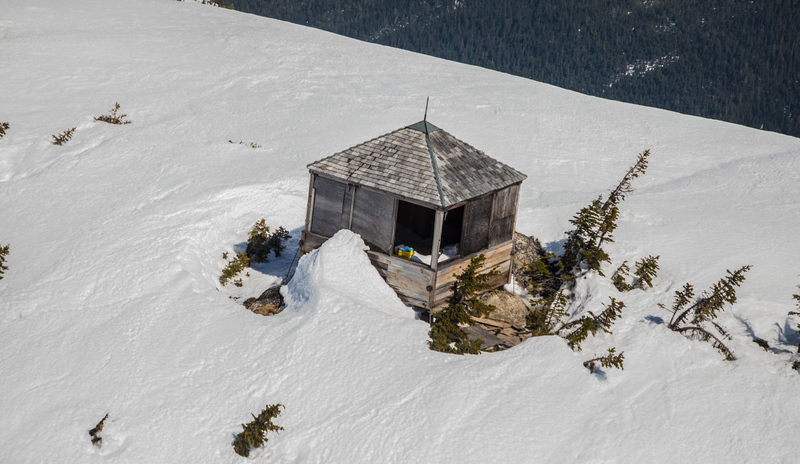 John had photographed the Mebee Pass lookout in 2006 and was curious to see how the fragile structure was doing as it faced its 80th Cascades winter. We were pleased to see it standing and in relatively good shape; however, the lookout's weathered frame gave a sense that it was only a matter of time before the inevitable winter storm that would collapse the walls altogether. Seeing the forlorn structure revived John's interest (and awakened mine) to see what could be done to save this last known L-5 cab. Mebee Pass lookout location map. (The lookout is located about 500' above and NE of Mebee Pass. Text from article: "Mebee Pass L-5 - Last of its Kind"
Western Washington photographers Steph Abegg and John Scurlock once again teamed up February 2 for some incredible winter aerial photography, including seven snow-clad fire lookouts, standing like sentinels against another winter in the North Cascades. Mebee Pass Lookout, in its 80th winter, caught their attention and revived John's interest in exploring what can be done to save this last remaining lookout of its type. It is the last known L-5, USFS Region 6's 10'x10' version of an early L-4, still standing only because of efforts taken in 2002 by three FFLA members. 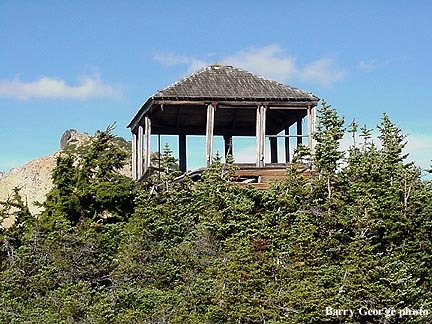 After the 2002 FFLA Conference in Winthrop, Barry George hiked in (18 miles round trip) and found the lookout barely standing, with one entire corner out. After several hikes back to the lookout, support from the Chuck Butler Memorial Fund to purchase materials, and the use of helicopter to transport the materials to the mountaintop, Barry and two other FFLA members, Doug McKeever and Jerry Huddle, completed vital stabilization measures that fall. Although there were ideas of doing additional restoration in the following years, nothing more has been done. FFLA member Bob Adler hiked into the lookout in 2008 and reported that it was still holding up reasonably well, but nevertheless, having been abandoned for 60 years now, could use some help. -Hike in with tape measures and cameras to assess and determine what the priorities would be in a repair mission. -Put together a list of materials and tools to accomplish the repair, and obtain them. -Assemble these things into a sling load and have it flown to the site. -Hike in with a group of volunteers to do the work. The enthusiasm about Mebee Pass lookout continued over the course of Spring 2013. The group "Friends of Mebee Pass Lookout" was officially formed. Over the course of the Summer 2013, this group embarked upon a frenzy of restoration efforts upon the tiny lookout cab. This page serves as a collection point for information about the Mebee Pass lookout and the restoration efforts of Summer 2013 and beyond. To donate to the restoration efforts, click the button below and follow the quick and easy instructions. 1933: Construction of the Mebee Pass lookout begins, continuing into 1934. 1954: Listed as "destroyed" in USFS depreciation records. 1974: Listed along with other historical structures in an inventory memo by the Okanogan NF. 2002: Preservation work by FFLA members Barry George, Doug McKeever, Jerry Huddle. 2006: Aerial photographer John Scurlock flew over and photographed the site. He photographed it again in 2007. 2008: FFLA member Bob Adler hiked in and reported lookout was holding up reasonably well. 2013: John Scurlock and Steph Abegg flew over and photographed the 80-year-old lookout with high resolution cameras. Their images inspired the formation of the Friends of Mebee Pass Lookout and the subsequent restoration efforts upon the tiny cab. 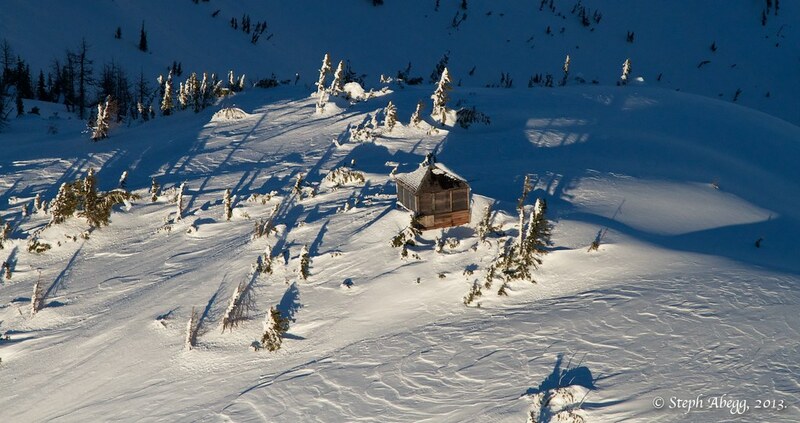 The Mebee Pass fire lookout was constructed on a rocky terrace above Mebee Pass in the North Cascades by the US Forest Service in the fiscal year 1934, though the actual construction probably occurred in 1933. The cost of the building was listed as $544.22. At that time, the forest was known as the Chelan National Forest. The Chelan NF eventually became part of the Okanogan and then Okanogan-Wenatchee National Forests. Today the building sits on the Methow Valley Ranger District of the OWNF. Materials for the original construction were packed into Mebee Pass by Gene Albin, and the construction was accomplished by Tracy Heath. Little is known about these two individuals, although records indicate that Heath was involved in other construction projects around the Chelan NF around that time. Gene Albin was one of the co-authors of the 1974 inventory memo (see below). A photograph taken around 1935 shows the building with shutters in place and in nearly-new condition. The building was constructed on the so-called L-5 Cab design of forest fire lookouts. As of February 28, 2013, it is thought to be the last of this design still standing. 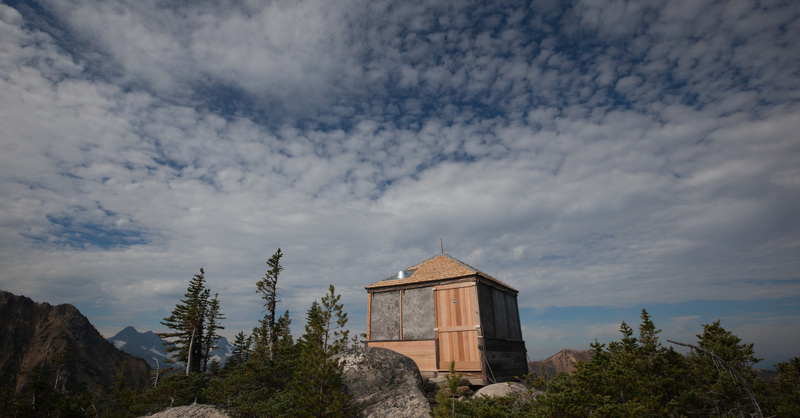 According to USFS depreciation records, the “Mebee Pass lookout house” was depreciated annually until 1937, when it was assigned a value of $491.73. The record then skips to the year 1954, where it is listed as “destroyed”, with a final cost of $546.25. Whatever action was taken in 1954 did not involve actual destruction of the building. A ground-based photograph taken in 1960 shows the building in good condition with an intact chimney and roof. The storm shutters appear to be in place as well. An inventory memo dated March 29 of 1974, from the Okanogan National Forest, listed the Mebee Pass lookout along with a number of other historical structures. This memo was authored by Francis Lufkin, Gene Albin, and Bill Lester. Lufkin was a pioneer of smokejumping; Albin was the packer who transported materials to the site for the original Mebee lookout construction. In 2002, a restoration effort was mounted by USFS employee Barry George, along with Forest Fire Lookout Association members Jerry Huddle and Doug McKeever. By this time, the lookout had deteriorated significantly, with windows and shutters missing, and one corner of the building broken down. The work conducted in 2002 strengthened the interior walls, stabilized and repaired the broken corner of the building, inventoried hardware, and placed ¼” plywood over the window openings. Although the work did not specifically comply with federal standards for restoration of historic structures, it almost certainly saved the lookout from collapse, and allowed it to remain standing for potential future restoration. Aerial photographer John Scurlock first visited the site on February 18, 2006. Photographs recorded then showed the building intact and in virtually the same condition as it was following the 2002 work. Scurlock also photographed it from the air on November 23, 2007. Bob Adler inspected it from the ground in 2008, taking extensive photographs. On February 2, 2013, Scurlock again photographed the Mebee Pass lookout on a flight conducted with his friend and frequent collaborator, climber and photographer Steph Abegg. On this flight, they used high resolution cameras and photographic techniques perfected over the course of numerous previous flights to mountainous regions across western North America. These detailed images again showed the lookout to be in good condition and appearing to be a candidate for restorative work. The images, released to a number of people with an interest in forest fire lookouts, triggered the planning today for mounting a restoration effort, and led directly to the formation of the group Friends of Mebee Pass Lookout. By the mid-1970s, most lookouts had been abandoned as fire-detection began to rely more on technology and aerial reconnaissance. Some were deconstructed by government agencies worried about liability, some have been left to rot, and some have been restored and are maintained by hikers. As of 2013, Washington has 87 fire lookout structures still standing in their original locations, with less than 30 of those still actively used for firefighting. In addition, there are some old lookouts that have been moved to museums. Most—though not all—of the standing lookouts in Washington are listed in the National Historic Lookout Register. Click on the image on the left to see a list and map of the remaining lookout structures in Washington. 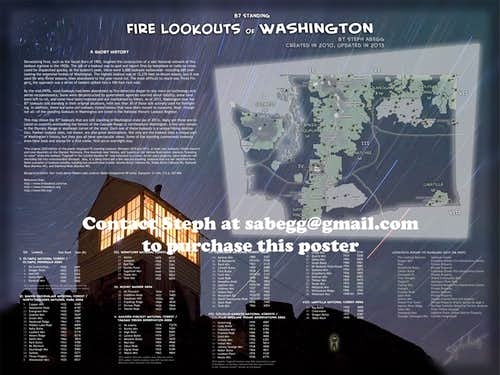 I also have a webpage specifically devoted to fire lookouts of Washington (link given above). A few years after construction in 1933. Photo possibly in 1935. Before the vital preservation efforts of 2002. Photo by Barry George, posted on the Forest Fire Lookouts page. Likely the first aerial photo ever taken of the lookout, by John Scurlock on Feb 18, 2006. Aerial photo from a flight by John Scurlock and Steph Abegg on Feb 2, 2013. Here is a brief summary of events so far. June 27, 2013: Cut away large log lying across the main log crossing of Granite Creek; installed a series of eyebolts on main log; cut away smaller deadfall on first 3/4 mile of trail after Granite Creek crossing. July 2, 2013: Placed more eyebolts and handles on log crossing of Granite Creek; built a platform on lower end of log. July 5, 9, 13, 2013: Crew of 2-7 people and 2 chainsaws put in a herculean effort clearing the countless deadfalls and tangles from the trail. July 17, 2013: First lookout assessment, 17 mile round trip. July 19-20, 2013: More trail clearing with chainsaws. Trail officially declared cut open. July 28, 2013: Cleared even more of the brush along the trail, using a machete. August 6-7, 2013: Conducted a detailed examination of the lookout structure; surveyed the site for helicopter landing options for future flying-in of supplies for restoration work. September 13-15, 2013: Flew materials (lumber, shingles, tools, and hardware) into lookout site via helicopter. This took five trips from the East Creek trailhead. A small crew of workers accompanied the materials, and still more hiked in on the trail. Over the weekend, these ten hard-working volunteers put on a new roof and new siding, attached a new door, fixed several critical structural problems with the foundation and walls, and installed a lightning protection system. September 18, 2013: Front page story about the restoration of the Mebee Pass Lookout in the Methow Valley News (read article). September 29, 2013: Another article about the restoration of the Mebee Pass Lookout, this time on the front page of the Bellingham Herald (read article). "On the whole, what has been done so far is the result of dogged determination and dedication by a group of very talented friends of Mebee Pass lookout. We still have work to do, obviously. The actual restoration work is the ultimate goal. Beyond that, we want to look ahead to strategies to convince the USFS to add East Creek to its "active roster" of maintained trails. Adopting the trail and maintaining it, along with possibly placing a new bridge across Granite Creek, are two of the components of that. But first we will focus on the lookout, our original and most important objective."